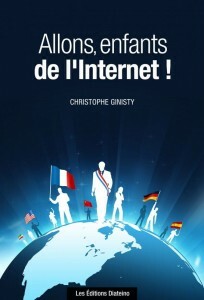 Because of more frequent trips to France, I happen to read more books written in French… I just posted a comment on Allons enfants de l’Internet on Amazon.fr, by Christophe Ginisty, the co-founder of Rumeur Publique, a PR agency and of Internet sans frontières (“Internet without Borders). The title of the book is coined after the French national anthem “Allons enfants de la patrie” (“Arise, children of the Fatherland’). Good title for the French market, as the song, initially the marching tune of a local regiment, was adopted instantly by the Parisian crowd who was to remove the King of France from his throne a few days later (August 1792). The message was local and became global. Today, any local message is global at the same time: a gunshot in Iran resounds throughout the world. This book is a relevant analysis of the impact of Internet for politicians: The Web is not “virtual society.” It is the space where the people of the real world live and express themselves. As a result, Christophe Ginisty invites elected representatives in Occidental democracies to start to better represent people by listening to them more carefully – and not try to play their political game as usual. While the Internet has helped elect various leaders in the recent years, the premium given to early political adopters is quickly disappearing, and the Internet society – the actual civil society – will demand that they are accountable. Book also available from the site of the publisher, Diateino.